By TLex DOXA Watches celebrate 50 years of Jenny watches with a wonderful re-edition of the caribbean 300. 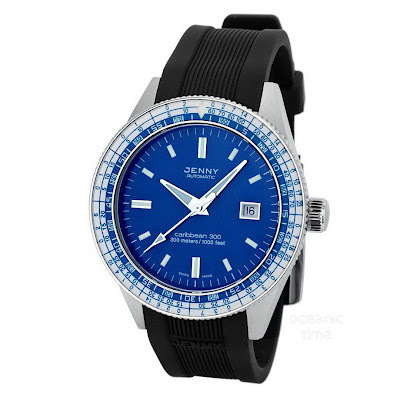 The Jenny caribbean 300 re-edition is a Limited Edition of 500 watches. It comes in 5 different dial bezel color combos: a black dial with either a yellow or orange bezel, a blue dial with a white bezel, an orange dial with an orange bezel or a silver dial with a black bezel. 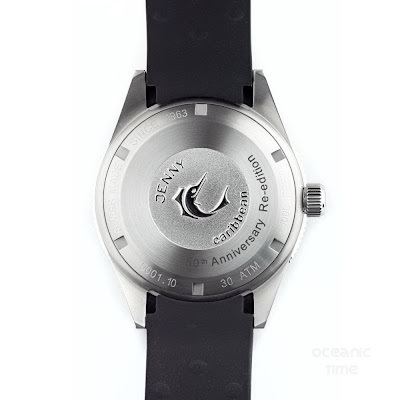 The watch case is constructed from 316L Stainless steel. It has a brushed finish and measures 42mm in diameter x 12.30mm thick. It features a Sapphire crystal with a diameter of 33mm (AR-coating inside), a unidirectional rotational divers bezel with a Sapphire crystal inlay plus 12hr luminous marker beneath it and Jenny's patented Non-Decompression table. 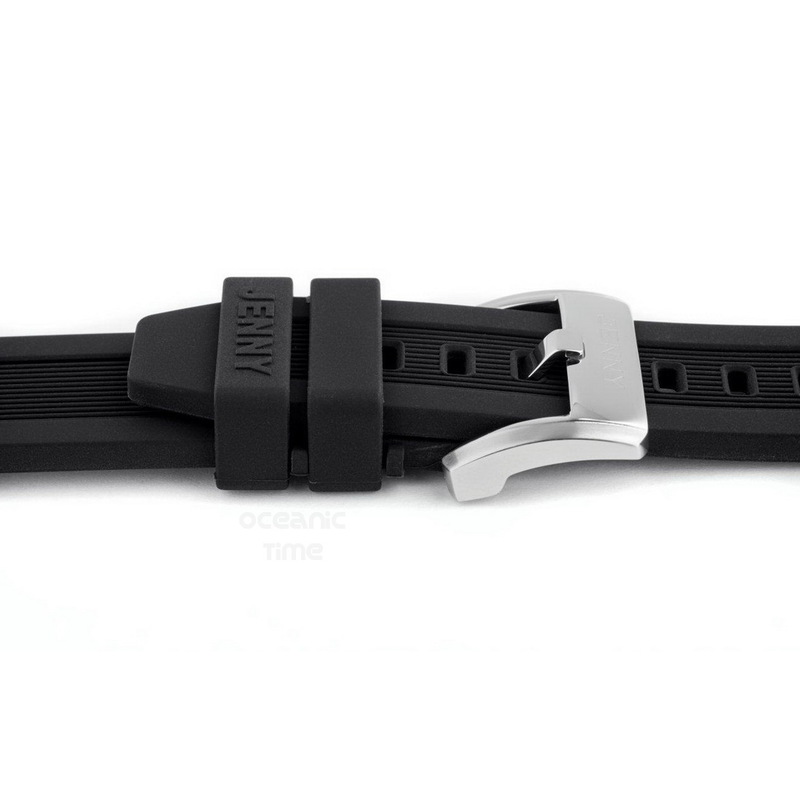 It has a water-resistance of 30ATM or 300M. The watch has a Jenny signed screwdown crown and a 12.30mm diameter caseback with a swordfish engraving. It is powered by a Swiss made ETA 2824-2 movement with a signed Jenny rotor. It is presented on a black custom Jenny signed rubber divers strap with a Stainless steel buckle. I can't say that I remember the original Jenny watches because I wasn't even a twinkle in my father's eye back in 1963, but I have seen on occasion pieces from vintage collectors. I find the non-decompression table an intriguing functional feature. Today it serves more of an aesthetic purpose (it looks cool), but in many ways it typified divers of its day. The 2013 caribbean 300 seems to be a faithful (in almost every detail) re-edition that should find favor with vintage connoisseurs. Whilst its technical updates such as the Sapphire bezel inlay etc. 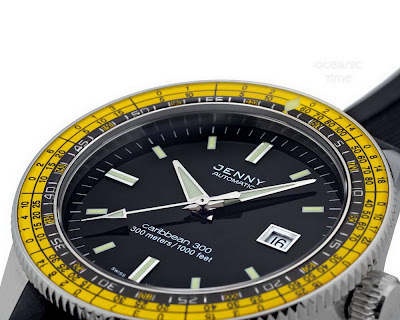 should appeal to collectors of retro and modern-vintage styled divers watches. 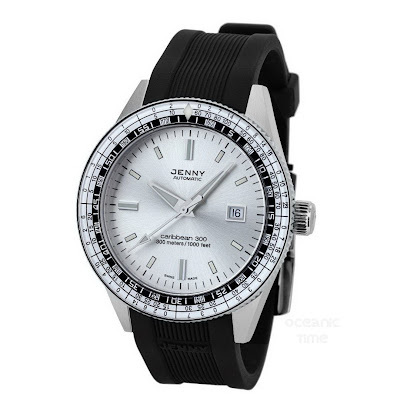 It seems that at this stage the watch will be released by Doxa rather than by a relaunched Jenny brand, who are sub brand of Doxa anyway. But you never know. We might be lucky enough to get a Jenny 'Flying Saucer' 1000m re-edition later down the road, too, now that would be really cool . . . 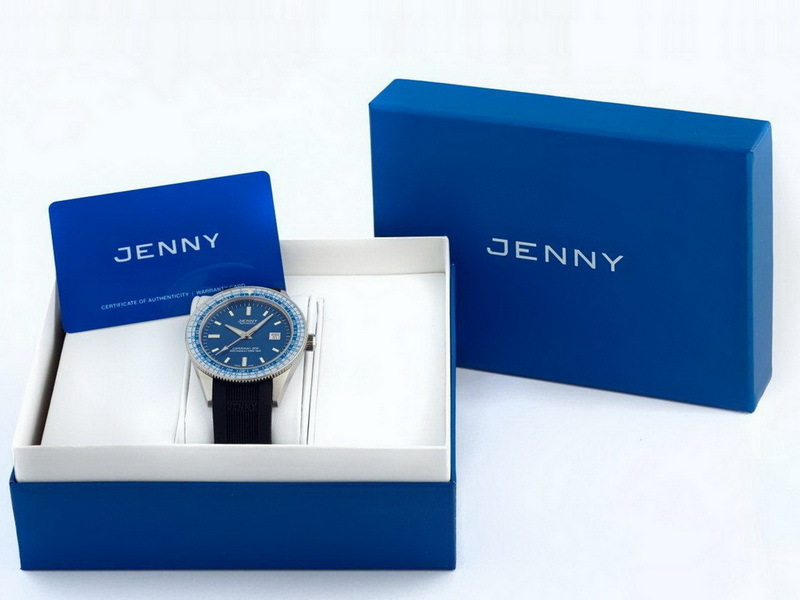 The new JENNY caribbean 300 Re-edition comes in a blue presentation box (below) priced 1290USD. 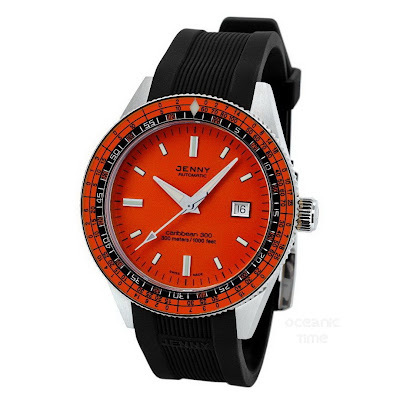 It can be pre-ordered directly from Doxa Watches. Follow the links: black dial with [yellow] or [orange] bezel, [blue] dial with white bezel, orange dial with [orange] bezel or [silver] dial with black bezel.